The Bushfire Store’s range of Tow Behind Sprayers are high quality, extremely versatile spraying equipment. They have been designed to perform and built to last. They can be used with fertilisers, pesticides, herbicides, fungicides and more. With a wide range of tank sizes, spray pumps and applications, the Tow Behind Sprayers range is perfect for the home gardener the industrial user and farmers. ● Tough Impact Resistant Tank. ● American Made. 12 Volt Chemical Spray Pump. ● Pressure Regulator with Gauge. ● Metal Spray Gun With Adjustable Spray Nozzle. ● Electrical Connector Cables. ● Twist-on Lid with breather. ● 5 Metre Spray Hose. ● Steel Trailer Frame. ● Pneumatic All-Terrain Tyres. ● Choice of Spray Booms. ● Extremely Versatile & Easy To Operate. ● Full Warranty & After Sales Support. ● Tough UV Stabilised Poly Tank With 15 Year Warranty. ● USA Made 12 Volt 7.5 L/min Delavan Pump. ● Pressure Regulator with Gauge. ● 6 Metres of High Quality Chemical Spray Hose. ● Spray Gun with Adjustable Nozzle. ● Galvanised Heavy Duty Steel Trailer Frame. ● Large All-Terrain tyres. ● Greasable Hubs. ● Australian Made. ● Tough UV Stabilised Poly Tank With 15 Year Warranty. ● Reliable Honda Motor. ● 12 L/min Commando Spray Pump. ● Pressure Regulator with Gauge. ● 30M Chemical Spray Hose Reel. ● Turbo Spray Gun with Adjustable Nozzle. ● Galvanised Heavy Duty Steel Trailer Frame. ● Large All-Terrain tyres. ● Greasable Hubs. ● Australian Made. ● 600L – 3000L Tough UV Stabilised Polyethylene Tank. ● Honda GX200 Motor. ● Italian Made Bertolini Pumps. ● Pressure Regulator with Gauge. ● High Quality Spray Hose on Reel. ● Spray Gun with Adjustable Nozzle. ● Galvanised Heavy Duty Steel Chassis. ● 15″ Steel Wheels. ● Leaf Spring Suspension. ● 50mm Tow Hitch. ● LED Lights and Brakes On Road Version Only. ● Australian Made. ● Fully customisable. ● Selection Of Spray Booms. ● Selection Of Rapid Reels & Remote Rewind Spray Reels. The tow behind sprayer trailer range are a great value sprayer. Combining spot spraying and broadcast spraying in one high quality sprayer trailer saves the user money and time. 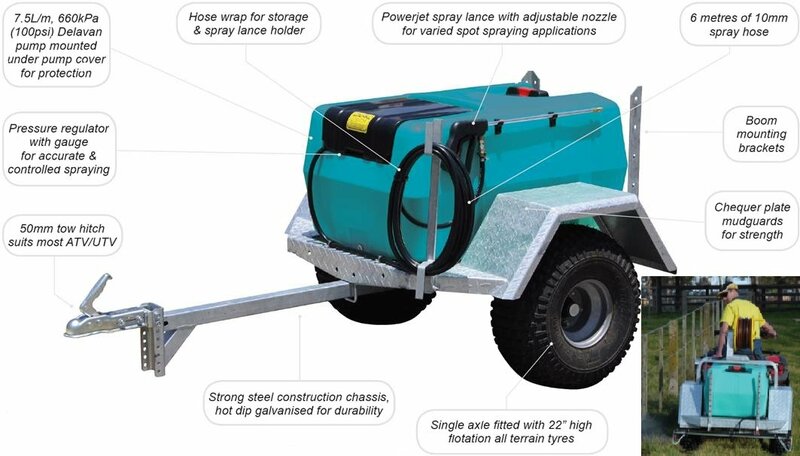 All of our tow behind sprayer trailers can be customised to your needs. 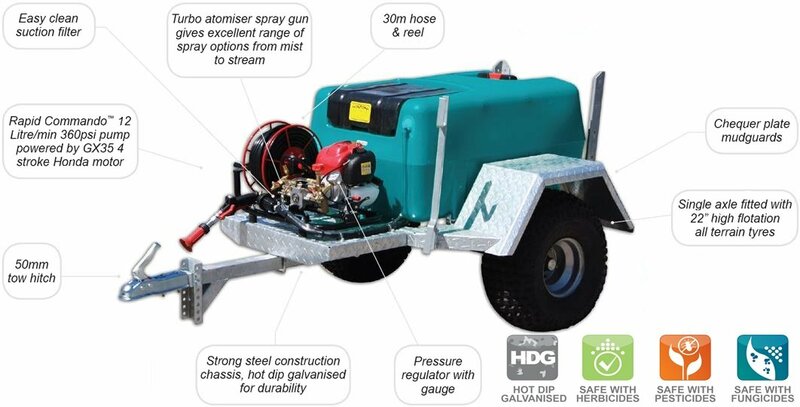 Extras and upgrades are available including higher flow spray pumps, hose reels and boom sprayers.